Often there is a gap between thinking about doing something and actually doing it and it can be a big one- therefore we have decided to help you. Are triathlons just for the super fit? Definitely not! The reality is that most people who compete are just like you. In Australia we have competitors in their 80's who compete. As you will soon discover triathletes come in all shapes and sizes, all with their own motivations for competing. The things that motivate people to compete varies enormously- fun and friendship, competition, the challenge, a mid-life crisis, for a dare, to lose weight to improve health, to grow as a person. Just watching a triathlon can be enough to inspire action. Once you know your reason for racing the rest is the easy part. Do I have to be a member to race? We encourage all triathletes to be a member of a local club. 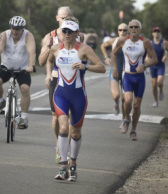 If you're on the Northern Beaches then Warringah Triathlon Club is the club for you. Although membership is stongly encouraged you can purchase an entry fee which includes a one race membership that covers your public liability insurance while you race at a club race. Warringah Triathlon Club runs events at North Head from September to April. In winter when the water is colder, duathlons involving a run, bike, run combination are the preferred option. Other events around the State and Australia are held during the same period. Sports Medicine Australia guidelines recommend all males over 35 and females over 45 should discuss their plans with their doctor first. Likewise anyone unaccustomed to regular exercise or those with health issues should also consult their GP. A club race is a perfect way to enter the sport of Triathlon. The short course at North Head will take a beginner somewhere between one hour and one and a half hours. If that is too much first up we encourage new members to complete as much of the course as they feel they can. Being part of a race is what is most important. As a guide a beginner might swim 100m in 2-4 minutes, a 10km ride would take 20-25 minutes and a 3 km run 15-18 minutes. There is a collective level of fatigue caused by linking the swim, bike and run together. This means a 3 km run that usually takes 15 minutes might now take you 16 or 17 minutes. Running off the bike is a totally foreign experience, it might be wise to practice this before the race. Do I need to train before my first race? While it is recommended, there is no reason why anyone can't simply enter a race. As a guide so long as you can swim the required distance (using whatever stroke) and regularly perform some exercise each week you should be okay to race. If you can't swim, then the best place to start is probably with a swim group. Local swimming pools have a "learn to swim" program for adults. Swimming 2-3 times per week for 4-8 weeks should have you more than ready to tackle your first triathlon. Another option is to compete as a team or to race duathlons (run, bike, run). Remember everyone started out just as you are so don't think you need to buy all the fancy equipment for your first race. .
Race attire- many first timers compete in board shorts and singlets for the men, while females race in bathers, slipping a pair of shorts or bike knicks on after the swim. The swim- goggles and bathers are the minimum requirement. In most cases you will be provided with a swim cap as a part of your race entry. A towel in transition is always a bonus to dry your feet. A wetsuit may be necessary if the water temperature or outside temperature is below 18 degrees. The bike- any bike so long as it is roadworthy will do. An approved helmet (check inside to see if it meets Australian Standards) is also required. Most people start out with a mountain bike or their 10 speed racer from school. A water bottle and sunglasses are an added bonus. Some Vaseline may help stop chaffing. The run- all you need is shoes and possibly socks, a hat and sunscreen. With time you can worry about, wetsuits, tri-suits, aerobars, deep rim wheels, carbon fibre frames and elastic laces but to start with keep it simple. For those who decide they want to invest some time into training for their first race, the following are to be used as a guide. Remember there is no one best way to prepare as we all vary as individuals i.e. our training history, age, fitness level etc. A specific triathlon coach will be able to provide you with a more specific program. How much time do I need to prepare? 3-6 times per week should be enough. Consistency is the most important part of your preparation. If you come from a swim, ride or run background, work on the disciplines that you are not accustomed to. Most people are good at working on their strengths - not their weaknesses. Aim to build up your distances/time spent training by 10% each week until you training time for each discipline is about 10 minutes longer than you think you will take for each leg on race day. Start off slowly, if you are not used to exercise then the intensity of training is what is going to leave you sore the next day. Keep the effort level in the mild or mild to moderate range where you notice an increase in your breathing rate, but where you can still hold a conversation with a training partner. Focus on freestyle and try to create a relaxed, long and fluid stroke. Breathing is often the downfall of many beginners. Learn to swim with your head in the water and breath on both sides. Swimming with flippers will assist you in your early stages. Do not be dismayed if you struggle initially, even the best triathletes can still remember when 50m seemed like a marathon. If you find it hard to master the basics of swimming then a "learn to swim" squad as mentioned previously will be the best place to start. Straight swimming can also get a little boring so why not jazz it up a little by breaking a long swim up into smaller sections i.e. a 600m swim becomes 2 x 100m, 4 x 50m and 8 x 25m or you could do a 500m ladder of 25, 50, 100, 150, 100, 50, 25m. Have a short rest between each effort to help you get your breath back. Simply riding to and from work or getting out on the weekend for a regular ride should be enough. Use bike paths or roads with cycle lanes. Concentrate on spinning along rather than pushing a big gear. A longer ride on the weekend should be enjoyed as a great way to relax. Running can take a heavy toll on the body because of the constant pounding. The best option is to start out walking and gradually add some jogs into the walk. Short quick strides are the most efficient way to run. Again this is only a guide and your plan will vary depending on your work and home commitments. This represents week 3 or an 8 week plan. Two sessions of each discipline should suit most, however if you are not accustomed to exercise it is probably best to just work on one or two of the legs at first. Get fit in one discipline before adding another. Two weeks before your race take the Saturday off and do a trial run on the Sunday, including 75% of the swim, bike and run distances. This will help you with your transitions and to allow you to learn any last minute tricks. If the race is in open water then try to do one or two swims in the open water. About 4 weeks out from your race start to incorporate some bricks into your training. This means following your Saturday ride with a short run of 5-10minutes immediately off the bike. This should help prepare your legs for the bike to run transition come race day. What about other forms of training? Stretching is probably the next most important aspect of training. Regular stretching helps to prevent injury caused by the constant repetition of movement. The shoulders, back and legs should all be stretched after exercise. Some general strength work for the shoulders, abdominals, back and legs may also help, however it would be wise to consult with a fitness professional, coach or physiotherapist for a specific program. A diary will provide you with feedback on how your fitness has improved and guide you on your long term training goals. Race day - Are there rules to follow? If you get in trouble on the swim, simply raise your hand and a support vessel will come to help. You can even catch your breath while you hold on. On the bike always ride to the left, and remain 7 m behind the bike ahead of you. If you pass another cyclist try to do so as quickly as possible (15 seconds) so you do not block the lane. Riding two abreast is not allowed. your chest should always be covered by a top when riding or running. Your state association should be able to provide you with a more comprehensive list of race rules. At registration, you will need to show your license if you are a member. If you are not a member, you will be required to pay a one race membership which is included in your entry fee. This covers you for public liability insurance for the event. 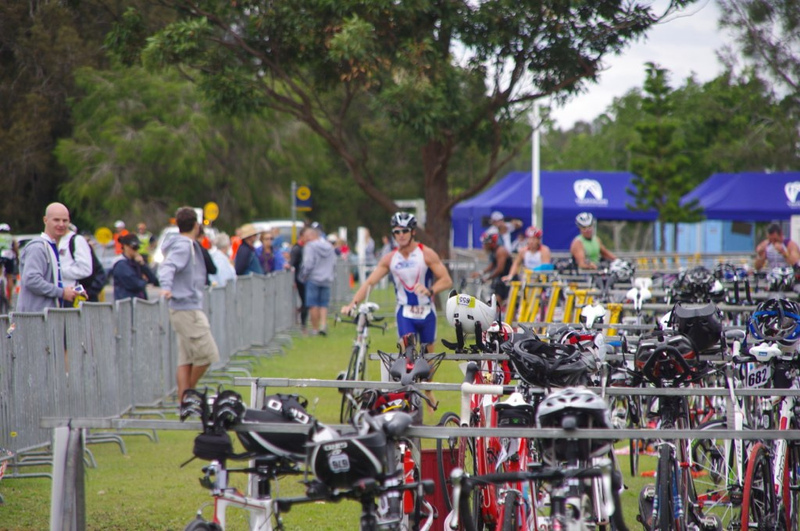 Take your gear into the transition area and rack your bike in the appropriate rack (race and age group). The earlier you arrive the better your rack position. Check the swim entry and exit; look for land marks you can use to swim towards. Make sure you are back in time to listen to the pre-race briefing. This is where the race director will explain the course and any specific points of interest. 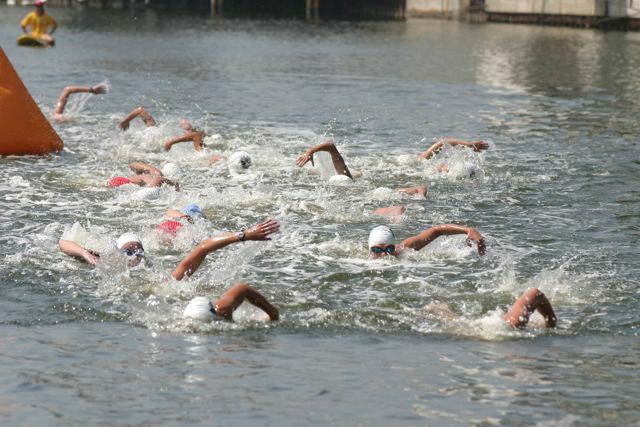 The start can be congested, start at the back and to the side if you are not a strong swimmer. Take it easy at the start of the ride, get your breathing under control and find a comfortable pace. Make sure you know where the run exit and take it easy at first, save the sprint for the finish line. So you conquered your first triathlon, what's next? Most people use their first year to simply experience the joys of racing, however there are plenty who are hooked after their first race, and want to move on to bigger and better events. Joining a club is probably the best step as we will be able to provide you with the training options, guidance and support required. Once you have made a commitment to join a club joining the state association is the final step in your transition of becoming a TRIATHLETE! Your state association is responsible for governing the development of triathlon through its affiliated clubs and coaches, and plays an important role in the quality control of triathlons by sanctioning races to ensure safety and excellence in race organization. For more informationVisit the other areas of our website, come to a race and marshall or volunteer, come to a race and race but most importantly meet fellow members of Warringah Triathlon Club. We can provide you with all the information you require to make the most of your triathlon adventure. Good luck and see you at the races. This article has been adapted from an article originally written by Nigel Pietsch of Triathlon South Australia - we thank you!